For various reasons, it was not possible, until recently, for us to put details of this book on to our website along with all our other books. We are happy to say that it is now here, where the movie is much more convincing! Enquiries or ordering can be done through the website in the usual way. Fifty years ago Benjamin Britten wrote Noye’s Fludde – an opera-for-all telling the story of Noah’s Ark with the main characters taken by adult opera singers alongside children playing animals, involving instrumentalists at all levels of ability and including hymns for all present to join in with. It was a tremendously popular work and is still widely performed. In 1974 the head of Pimlico School in London, Kathleen Mitchell, asked Britten to write another such opera for performance at the school. The composer went to the same source, the Chester Miracle Cycle and selected scenes for a Christmas Sequence which would again afford opportunities for collaboration between professional musicians and schoolchildren. Sadly, the second draft of this libretto has remained only as a typescript in the Britten-Pears Library because the composer died before any music had been written. Dr Andrew Plant, until recently Curator of the Library, warmed to our idea of the work coming to life as a book filled with images as evocative as the music would have been. He writes an introduction to establish the story and then Angela Lemaire has cut magnificent woodblocks which capture a splendid sense of the medieval play, its presentation by contemporary children and a mystical rendering of the events surrounding the birth of Jesus. The scenes included involve the Salutation – which introduce Gabriel, Mary and Joseph, Elizabeth and midwives who arrive for the birth; The Shepherds; the Magi; Herod and the Innocents and the knights who carry out the orders to kill. The language is wonderfully down to earth and designed to entertain in the market places of medieval Chester and the surrounding towns and retains that power. The woodcuts dance through every page – 76 blocks were cut and printed in midnight black (which is slightly blue) weaving between the blocks of text, printed in seville black (slightly orange). The binding was inspired by the colours of medieval stained glass, green images on blue for the covers with a black leather spine as though leading on the window. A deep red cloth on the slipcase surrounds a large label printed on golden yellow paper. 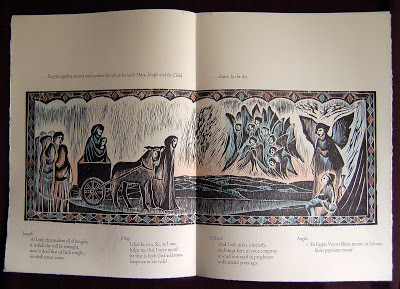 As with some of her other books with The Old Stile Press, Angela has hand-coloured ten copies for a special edition. This version is bound as the main edition but housed in a lined, drop-back box.